On Wednesday founder Richard Jones attended Cllr Rhys Lewis inauguration as Mayor of Rhondda Cynon Taff. Richard was pleased to have attended the event supporting Cllr Lewis who is not only a friend but someone who has a keen interest in improving equality for people with disabilities. Cllr Lewis is keen to raise the awareness of hidden disabilities such as mental health conditions which is something that Accessible News wholeheartedly supports. 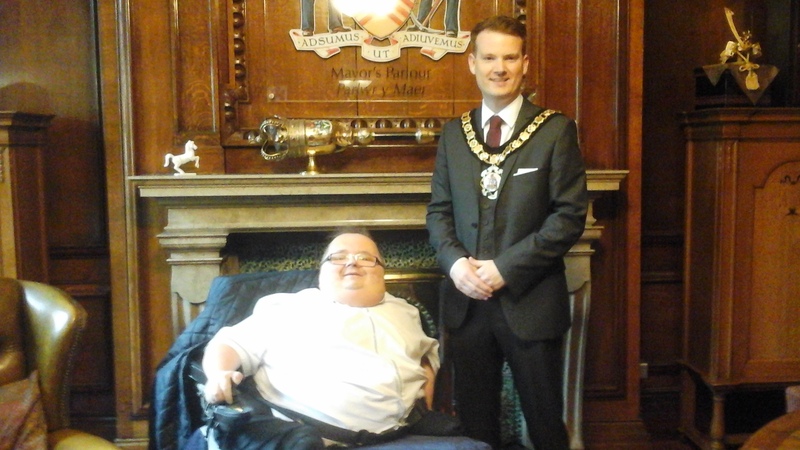 Richard is looking forward to working with Cllr Lewis during his time as Mayor, working on fundraising events and raising awareness of disability issues. The Mayor’s chose charities and more information can be found here . I think Cllr Lewis will be a credit to the county and bring a fresh approach to the role of Mayor. I look forward to working with him on charity fundraising events and more. It was a pleasure to have been invited to such a fantastic evening set in such prestigious surrounds as the Mayor’s Parlour. 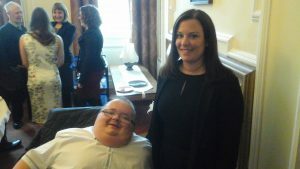 Also attending the event was Vikki Howells AM, Vikki is someone who is also a big supporter of disability equality and raising awareness of disability issues and has a close working relationship with Richard and Accessible News having worked on case work together. Remember if you live in South Wales and you have a query, question or concern get in touch by telephoning 01685 884302/01685 810432.